Our furry working friends are now exposed to a risk not seen before in the K-9 world, overdosing. While trained hounds help keep our officers safe and sniff out dangerous weapons, drugs and paraphernalia, they are also unknowingly risking their lives to find opioids before a human officer ever touches them. Last year, three south Florida police dogs overdosed on fentanyl while searching an empty house for hidden cash during an investigation into a heroin ring. 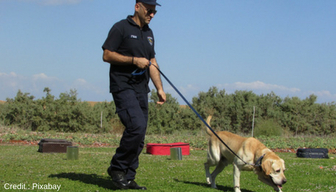 The dog’s handlers first entered the home to look for any dangers that may hurt the pooches before their search, for things such as broken glass, chemical spills or other obvious dangers. Once the handlers cleared the scene for K-9 investigations, the three dogs named Primus, Packer and Finn. The search only revealed a small stash of marijuana, but once the dogs returned to their cars, their handlers watched the animals react strangely. They refused to drink water, or focus their attention to commands, leaning back instead of standing at attention and their handlers became concerned as to what they may have encountered. They drove the animals to an emergency animal hospital and upon arrival became alerted by the rest of the team that stash of fentanyl was discovered in ceiling of the searched home, far from the dogs nose or sniff reach. Thankfully once at the hospital the three hounds were revived with Naloxone, the same opioid reversal drugs used in the event of a human overdose. These dogs were lucky, but not every handler is aware of the signs of overdose in a dog, or prepared in the case of one. Every dog reacts differently to an exposure, but according to Cynthia Otto, the director of the University of Pennsylvania’s Working Dog Center, there are certain signs to look for. Otto noted that some of the older, more laid-back dogs might become lethargic, “down for the count” as a matter of fact, after only minutes of exposure. Younger more lively dogs can become more excited. Fentanyl can be used on animals by veterinarian use only, and when intravenously injected it is safe for pain management and animal sedation. While dogs are able to take Fentanyl for pain, their bodies require a much higher dosage, nearly 20 times that of a human dose. The Canine species does have opioid receptors just like humans do, which means the same medication for treating human overdoses is safe to use on an overdosed pup too. Naloxone can be given to dogs in a hospital setting intravenously or in the field through the intranasal spray. Law enforcement officials believe Primus, Packer and Finn may never have directly sniffed the fentanyl stash but rather particles of the synthetic drug had contaminated areas in the house, maybe even a couch or a coffee table, and that’s how the dogs became effected. It could have been sniffed or licked off of the dogs paw and ingested accidentally. That knowledge alone can attest to the strength of the synthetic cousin to heroin. Despite the clear threat to police companions face first in danger, the care and education for them is lacking. Worse than handlers unaware of the overdose signs, only four states have an actual protocol for caring for an overdosed agent. Illinois, New York, New Jersey and Maryland — will allow working dogs to be transported to an animal hospital via an ambulance. Ohio and Colorado are just two states that allow EMS technicians to provide care to working dogs. New York currently has a pending bill to become the first state to allow both access to care and transportation for working dogs. These animals are in need of our protection, and this time a bulletproof vest isn’t enough defense for man’s best friend.